Many evangelical Christians think global warming is a serious issue that demands drastic action.1 At the Institute for Creation Research we tend to be skeptical of the claim that increasing amounts of carbon dioxide (CO2) will cause Earth to overheat.2 Climate change proponents say their case is built on scientific evidence. However, old-earth beliefs actually make a major contribution to climate change alarmism. 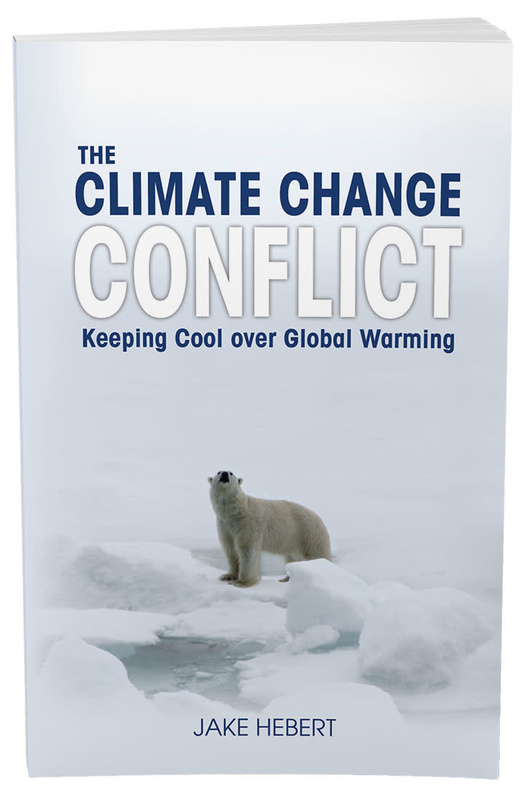 However, our climate is complicated, and a change in one thing inevitably causes a response somewhere else. Some of these responses are called negative feedbacks, which minimize or oppose a warming tendency. On the other hand, positive feedbacks enhance the initial warming. If climate sensitivity is high, then the effect of positive feedbacks will dominate and there will be a large increase in temperature after the climate has settled down. But if climate sensitivity is low, then the negative feedbacks will tend to balance the positive feedbacks, resulting in a smaller temperature increase. Scientists worried about climate change tend to think climate sensitivity is very high. 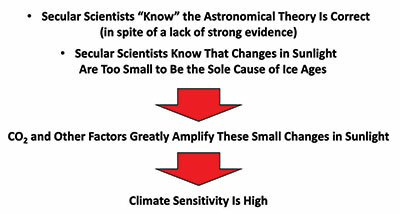 Those who are less concerned believe climate sensitivity is low. If we ignore questionable research, there are two main reasons some researchers think climate sensitivity is high. In the secular view, our climate slowly alternates between colder glacials (ice ages) and warmer interglacials. 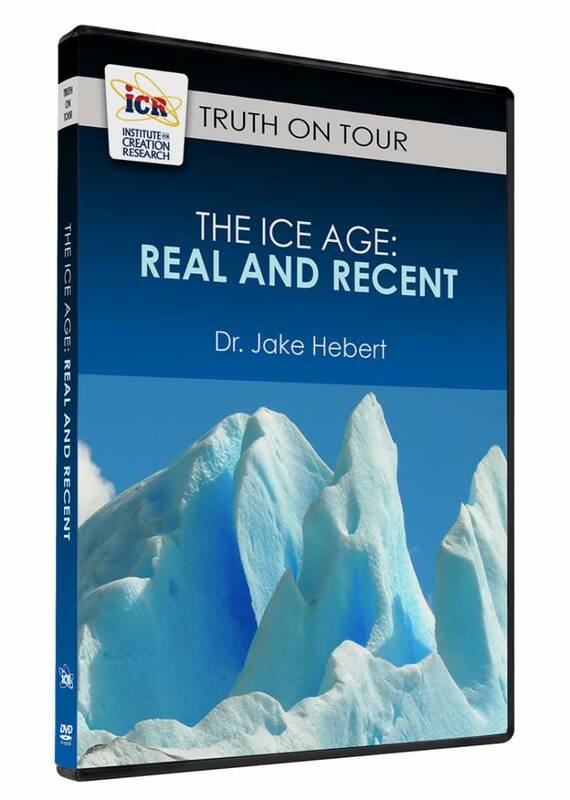 Secular scientists think the timing of ice ages is controlled by changes in the way sunlight striking the Earth is distributed with latitude and season. They think these sunlight changes are themselves caused by variations in Earth’s orbital and rotational motions. 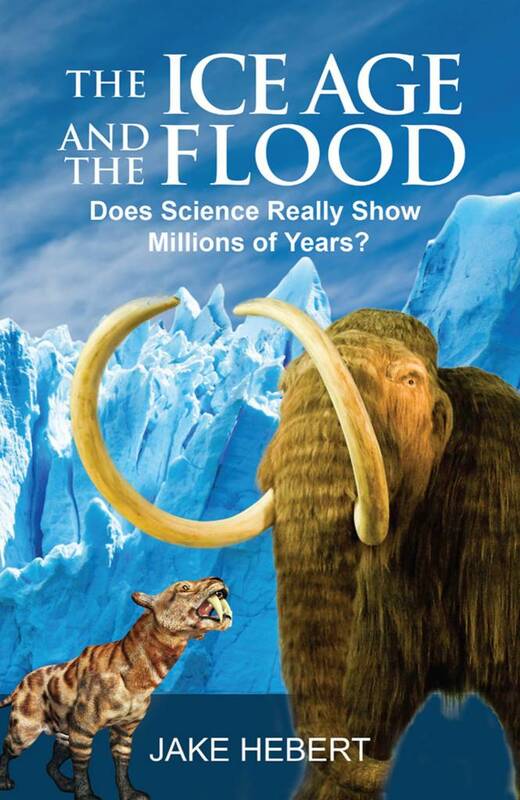 This particular belief about past climate change is called the astronomical or Milankovitch ice age theory. The astronomical theory has many problems. First, evidence for the theory is weak, as discussed below. Second, the changes in sunlight are so small that it’s difficult to see how they alone could cause ice ages. Well-known secular astronomer Fred Hoyle once ridiculed the Milankovitch theory for this very reason.7 The astronomical theory only works if these small changes in sunlight can somehow be amplified. So, what do secular scientists think is amplifying these small changes in sunlight? If you guessed carbon dioxide, go to the head of the class! Figure 1. 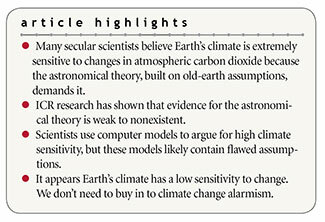 The circular reasoning used by uniformitarian (old-earth) scientists to conclude that climate sensitivity is high. Obviously, these conclusions are only correct if the astronomical theory itself is correct. So, how strong is the evidence for the theory? The Astronomical Theory: What’s the Evidence? Two factors make the theory seem much stronger than it really is. One is the sheer number of published papers on the subject. An internet search for “Milankovitch theory” produces more than 100,000 results! However, nearly all the technical papers on the subject simply assume the theory to be correct. Secular scientists then use that assumption to assign ages to ice and deep-sea cores and/or to draw conclusions about past or future climate change. Figure 2. 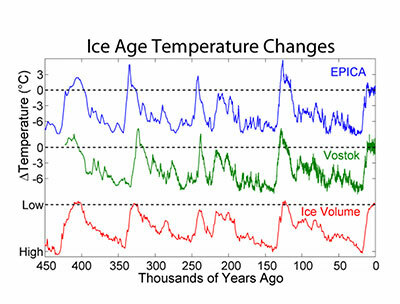 Chart showing a close agreement, apparently lasting hundreds of thousands of years, between inferred temperatures and global ice volume. The blue and green lines reflect temperature changes inferred from chemical measurements in two Antarctic ice cores. The red line is global ice volume inferred from chemical measurements in deep-sea sediment cores. Despite appearances, charts such as these are not strong arguments either for an old earth or for the astronomical theory. Copyright © Robert A. Rohde. Used in accordance with federal copyright (fair use doctrine) law. Usage by ICR does not imply endorsement of copyright holder. The second factor is the existence of charts such as the one in Figure 2. These kinds of charts are extremely common in both popular and technical science publications. The blue and green lines are changes in temperature inferred from the chemistry of two deep Antarctic ice cores. The red line is global ice volume inferred from the chemistry of deep-sea sediments. Note that the red pattern is upside down, with “high” ice volumes at the bottom and “low” ice volumes at the top. The three sets of wiggles seem to track very well with each other. Ice volume increases when temperature falls and decreases when temperature rises. It looks like all three lines are telling a consistent story about climate change over the last 450,000 years. Furthermore, it’s not too hard to show that the times of greatest ice volume agree with Milanovitch expectations. This might seem to be an incredibly powerful argument for both an old earth and the astronomical theory. If independent datasets are telling the same story about climate change over hundreds of thousands of years, how can any reasonable person doubt either millions of years or the astronomical theory? But the appearance of this argument’s validity is actually superficial because the datasets are not independent. When scientists extract cores from the ocean floor and ice sheets, the cores don’t come with marked ages. Secular scientists recognize that radioisotope dating methods are of little help in dating the cores. For this reason, they use the astronomical theory to assign ages to the cores in a process called orbital tuning.15 They think that maximum and minimum values of chemical wiggles in the cores indicate the deepest parts of cold glacials and the warmest parts of warm interglacials. Furthermore, they think the astronomical theory gives them the times in the prehistoric past at which these climate changes occurred. The tuning process requires some sections of the wiggly patterns to be “squished” and other sections to be “stretched” in an accordion-like fashion. Orbital tuning involves a huge potential for self-deception because it gives the “tuner” the freedom to selectively stretch and compress different parts of the chemical wiggle patterns in the sediment and ice cores. With this freedom, there’s a good chance that the tuner can force the pattern to look like those shown in Figure 2. This is true even if the wiggles have nothing at all to do with climate. This means you can force the patterns to agree with the Milankovitch theory even if the theory is wrong! Even secular scientists have given pointed warnings about the dangers of circular reasoning in orbital tuning.14-16 This is why Figure 2, despite appearances, is really not a strong argument for the astronomical theory. The wiggly patterns agree with the theory because orbital tuning made them agree! Before Christians jump on the climate change bandwagon, they need to understand why secular scientists are making the claims they do. These scientists say our climate is very sensitive to changes in carbon dioxide (CO2) because of the results of computer climate models and their old-earth interpretation of chemical wiggles in deep-sea sediments. However, the computer models are likely overestimating climate sensitivity. Likewise, the old-earth interpretation of deep-sea sediment data is coming from the astronomical (Milankovitch) ice age theory. Yet there is little, if any, evidence for this theory, even by secular reckoning. God gave His promise to Noah after the Flood for an overall climate stability. Although Christians should certainly practice good stewardship over the earth, we don’t need to succumb to demands for drastic action based on faulty science and millions-of-years manipulations. We’d expect climate sensitivity to be low because God has designed Earth and its systems and gave His promise to Noah after the Flood for an overall climate stability (Genesis 8:22). Sacks, E. The gospel of climate change: Green pastors bringing environmentalism to evangelicals. NBC News. Posted on nbcnews.com April 22, 2018, accessed January 14, 2019. Cupps, V. R. and J. Hebert. 2016. A Realistic Look at Global Warming. Acts & Facts. 45 (4): 10-13. Biello, D. The Most Important Number in Climate Change: Just how sensitive is Earth’s climate to increasing concentrations of carbon dioxide? Scientific American. Posted on scientificamerican.com November 30, 2015, accessed February 26, 2019. Chandler, D. L. Explained: Climate sensitivity. MIT News. Posted on news.mit.edu March 19, 2010, accessed February 26, 2019. Spencer, R. New Lewis & Curry Study Concludes Climate Sensitivity is Low. Posted on drroyspencer.com April 24, 2018, accessed October 8, 2018. Hebert, J. Important Climate-Change Realism Paper Published. Creation Science Update. Posted on ICR.org June 12, 2018, accessed January 14, 2019. Hebert, J. 2018. 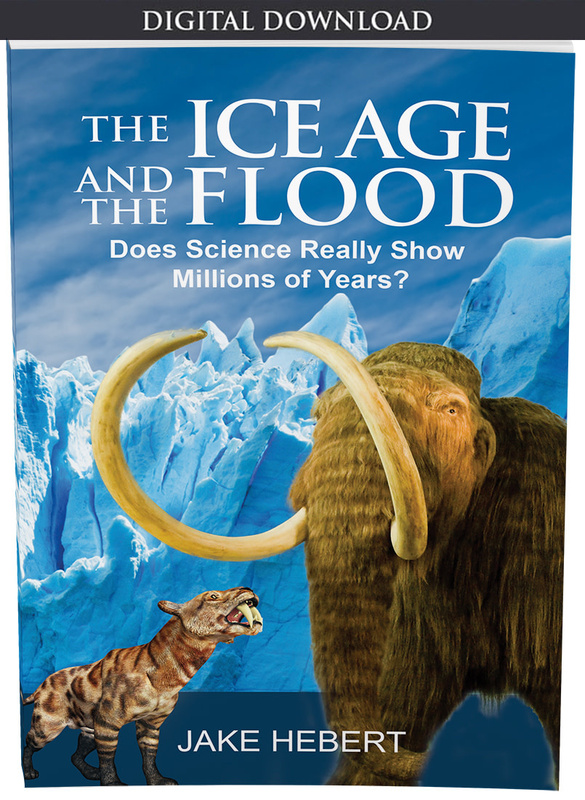 The Bible Best Explains the Ice Age. Acts & Facts. 47 (11): 10-13. Kerr, R. A. 1997. Upstart Ice Age Theory Gets Attentive But Chilly Hearing. Science. 277 (5323): 183-184. Schmittner, A. Paleoclimate. Introduction to Climate Science. Online text for Oregon State University, College of Earth, Ocean, and Atmospheric Sciences. Posted on library.open.oregonstate.edu, accessed January 4, 2019. Nuccitelli, D. How sensitive is our climate? Skeptical Science. Posted on skepticalscience.com, accessed November 13, 2018. Hays, J. D., J. Imbrie, and N. J. Shackleton. 1976. Variations in the Earth’s Orbit: Pacemaker of the Ice Ages. Science. 194 (4270): 1121-1132. Hebert, J. ‘Big Science’ Celebrates Invalid Milankovitch Paper. Creation Science Update. Posted on ICR.org December 26, 2016, accessed January 14, 2019. Raymo, M. E. 1997. The timing of major climate terminations. Paleoceanography and Paleoclimatology. 12 (4): 577-585. Monastersky, R. 1997. The Big Chill: Does dust drive Earth’s ice ages? Science News. 152 (14): 220. Hebert, J. 2016. Deep Core Dating and Circular Reasoning. Acts & Facts. 45 (3): 9-11. Neeman, B. U. 1993. Orbital Tuning of Paleoclimatic Records: A Reassessment. Ernest Orlando Lawrence Berkeley National Laboratory. LBNL-39572, UC-412. Cite this article: Jake Hebert, Ph.D. 2019. Climate Alarmism and the Age of the Earth. Acts & Facts. 48 (4).